In December 2018 we hosted our first 1940s, 50s and 60s Afternoon Tea and Dance with a special appearance from the marvellous Miss Marina Mae who evoked memories of the wartime era! After much anticipation, we are excited to announce that Miss Marina Mae is returning to The Earl Of Doncaster on Sunday 24th February for another spectacular 1940s, 50s and 60s Afternoon Tea and Dance. We will also be hosting Afternoon Tea Dances throughout 2019 so make sure you keep a look out for future dates! We are looking forward to seeing your best outfits and moves in the ballroom! Marina is known not just for her vocal ability but her classic beauty, warm personality and comedic charm… a modern day Forces Sweetheart! 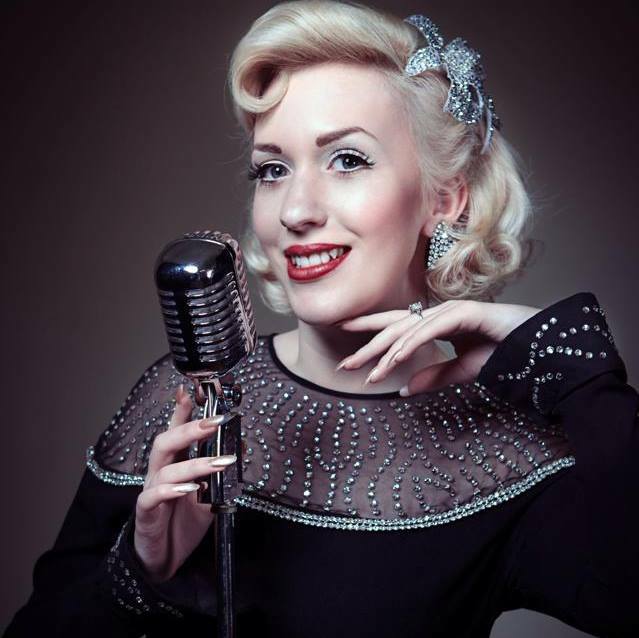 Miss Marina Mae brought vintage charm to the 21st Century and performed a truly authentic, nostalgic and spectacular show effortlessly gliding from big band swing to Gracie Fields comedy songs. Marina has a sparkling stage presence and dazzled her audience with her vocal ability! Wearing only authentic stage costume to suit both daytime and evening events, her repertoire included over 2 hours of songs from the wartime era, as well as many more hits from following decades to accommodate all music tastes. As the performance began, we were swept away as the ballroom dance floor was bursting with dancers from the flying 40s, the fabulous 50s and the swinging 60s. Whether you were dancing the Jive, Foxtrot, Quickstep, and the Waltz, it was a truly enchanting experience for all! Old or young, experienced or beginner, there was something for everybody! It was then time to take the weight off your feet and break for a timeless afternoon tea. The silver cake stands were filled with delicious sandwiches, scones and cakes, and what better to wash it down with than a well-deserved English cuppa! I was lucky to experience the first Afternoon Tea Dance as a guest of the Earl, I can truly say it was everything I had hoped for and more. I luck forward to the next one in February.